Gravitational waves may be the most exciting thing in astronomy right now, but there are only so many things in space that scientists can study with Earth-based gravitational wave detectors. An incredible new test has demonstrated that space-based detectors could become a reality, which could open our ears to entirely new sources of gravitational waves. Detecting the teeny changes in space from passing gravitational waves with a detector requires reducing or identifying as many of the sources of outside disturbances as possible. 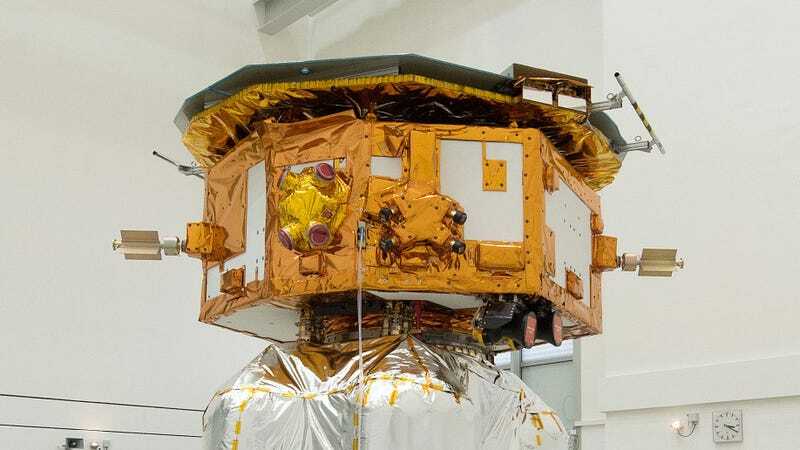 A consortium of scientists including those from NASA and the European Space Agency recently used the LISA Pathfinder spacecraft as a test to see whether a future experiment could reduce the noise to a pre-determined level. It demolished expectations, performing at least 20 times better than it was required to, according to new results. To quickly recap what we mean by all of this, Albert Einstein once predicted that some super insane space events, like black holes colliding, should create ripples in the shape of spacetime that travel at the speed of light. Scientists first detected these waves using a pair of experiments, each called LIGO, in 2015. The discovery netted the 2017 Nobel Prize in Physics. Also in 2017, observatories around the world spotted gravitational waves from a pair of colliding neutron stars alongside a burst of light, heralding a new era of astronomy where scientists can rely on light and gravity together to understand astrophysical phenomena. But Earth-based gravitational wave experiments are only sensitive to certain kinds of waves whose colliding sources weigh around the same as stars. They are deaf to collisions between enormous supermassive black holes like the one at the center of our own galaxy—gravitational waves that peak less than ten times per second. LISA Pathfinder is a test run of a future mission, LISA, planned for launch in 2034, which could potentially open our ears to these events. LISA would consist of three spacecraft with lasers beamed between them, each separated by 2.5 million kilometers or 1.5 million miles, trailing behind the Earth in orbit. A passing gravitational wave would change the shape of space a tiny bit, shortening the path the laser has to travel between two of the three units. These ships are composed of a metal cube mirror, surrounded by a craft with the lightest thrusters making corrections. The cube must remain in constant free-fall. All sources of acceleration on the cube must either be isolated or understood. That’s what the team of scientists is reporting today in Physical Review Letters. LISA Pathfinder is essentially one of the three LISA ships, currently in space and launched in late 2015, with two cubes isolated from the outside world by the spacecraft. The researchers characterized the noise to several factors better than their mission objective. Essentially, they understand the noise so well, and the cubes receive such little outside acceleration, that the machine would be able to detect the gravity from a mosquito if it were to fly around inside of it, said Wass. Understanding the noise is just part of the challenge. The researchers must still complete the system of three spacecraft working in tandem and the lasers between them. But they’re working on that as we speak. And yes, I asked about what happens if they get hit by an asteroid. That’s unlikely, given how small each craft is. The researchers have characterized the effects of micrometeorites too, and if one of the crafts gets jostled a little, the team can always just exclude that bit of data. But yes, it would be bad if something huge came along and walloped one of the three arms. In the meantime, scientists have proposed other ways to detect this population of gravitational waves using things like pulsar timing arrays. But just know that gravitational wave detectors are going to space—and when they do, they’ll be spotting some if the wildest physical events imaginable.